A specially arranged cricket match will take place at Horseshoe Point on Sunday, May 13 in memory of Pattaya Cricket Club founder and player, Elfrado ‘Slasher’ Roberts who passed away recently. 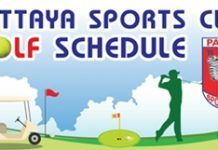 The Pattaya Cricket Club will field a team against the British Club Bangkok with play due to start at 12 p.m. Everyone is welcome to come down and enjoy the cricket and the attractions of Horseshoe Point. Refreshments, including BBQ food and beer at only 50 baht will be available for spectators.